Y’all! I AM TRANSFORMING MY CLASSROOM WITH TECHNOLOGY! There was so much to take away from the Kenan Summer Learning Institute, but the activity that stuck with me the most was the Goosechase digital scavenger hunt. 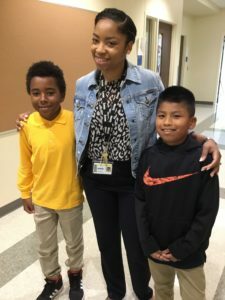 The level of collaboration and discovery learning was off the charts, and I knew I had to find a way to incorporate that in my classroom because, as I learned during my internship, collaboration and self-directed learning are among the skills most needed in STEM-industry careers today. The problem? Goosechase isn’t an option because it costs serious paper for a subscription. Enter the reliable lifesaver, GOOGLE FORMS! Using this FREE resource, I created a digital scavenger hunt that blew away my students on day 1. Reviewing school rules and procedures is deadly boring, but it is a necessary part of the first weeks of school. Instead of teaching these from the same Powerpoint that my 5th graders have seen year after year, the students used my Back-to-School Digital Scavenger Hunt to show what they already know. In groups of 3-5, they traversed the classroom and school to model behavior, show new students key locations, and learn the things they need to know about my classroom, their new learning environment. Demonstrate EAGLES behavior – Show what you know! To complete these challenges, you and your team will need to model exemplary Eagle behaviors and provide evidence (photo or video). Around the School – For this quick hunt, you will take pictures of your teammates at various locations in RWSA. REMEMBER: don’t disrupt any classes; don’t run; don’t be loud. DO HAVE FUN! I have had the best and easiest start to the new school year of my entire career as a teacher. 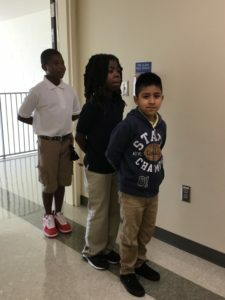 Every single student reported loving this activity, and most reflected that, because I trusted them to return and to show good behavior, they felt responsible. 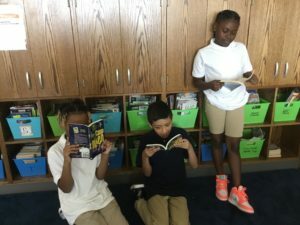 The staff around the school reported that students were truly engaged and that they behaved well. Needless to say, we are all itching to do this again STAT. Find the classroom library and take a picture with a mystery novel. Take a picture demonstrating EAGLES hallway behavior. This entry was posted in Uncategorized on September 24, 2018 by Tiffany Fitzgerald. Whatever you think the engineering field and STEM education is about, SCRAP IT, JON SNOW. YOU KNOW NOTHING. My biggest takeaway (and also my biggest surprise) from my time at Siemens is one word: APPRENTICESHIPS. We need them, they need our students, and we aren’t making that happen. A 4-year university isn’t the only answer to a successful career for every student. Apprenticeship programs might be the educational-makeover this country needs. At Siemens, students in high school can enter apprenticeship programs geared towards welding, machining, milling, and industrial mechanics. I was fortunate enough to interview a current apprentice, Nic, who is finishing his 4th, and final, year in the program. Nic told us that he wasn’t interested in a 4-year degree because of the time and cost required, as well as the looming debt after graduation. As a machinist apprentice, Nic is paid for full-time work which includes his hours in college, and his college expense is paid completely. He will have a 2-year degree, as well as necessary certifications, at the conclusion of his apprenticeship next month. Nic reports that he is happy with the work because it is hands-on, that his pay exceeds that of his friends of the same age, and that the position allows him to have a great work-school-social-life balance. I asked Nic if he encourages his peers to try an apprenticeship. He said he has encouraged his friends, but they aren’t interested because they think they lack the background knowledge and should go for a 4-year degree. Nic’s story is proof that university isn’t the answer for everyone, but we are selling the same, one-size-fits dream to all students. How can we not explore other options for our students? Another key takeaway is that male and female students tend to come into the engineering field differently. I interviewed engineers of both genders, and their answers were different. Charles Smith, a Senior Engineer at Duke Energy, indicated that engineering came naturally to him and was later supported by his education. He stated, “As a young boy I was fascinated by and enjoyed helping with construction. I found that I was good at coming up with creative ways to solve problems and “making things work.” The high school I attended, West Mecklenburg, offered Drafting, Architecture, and Engineering courses, which I took my freshmen, sophomore and junior years respectively.” Erin Reibold, Business Improvement Manager at Siemens Energy Hub, has an undergraduate degree in Industrial Engineering and graduate degree in Manufacturing Operations. When I asked her how she came to this field, she reported that a teacher turned her on to it. She stated that her 4th grade teacher praised her skills in math and suggested that math is a “language” for her. After that, she found that activities that encouraged building or engineering became interesting to her. Based on this, the influence of STEM education on these two individuals’ career path is clear. However, Mr. Smith seemed to be aware of his natural inclination whereas Mrs. Reibold was guided by an educator initially. How can we make engineering a natural path for women? The biggest challenge that I have faced is having enough time to create products for every amazing idea presented to me by a Siemens employee. My main product is a blended learning unit, How To Work Like an Engineer, but I have rudimentary plans for creating classroom signage that reflects the core values at Siemens and to implement engineering-based organization for tools, safety data, and workflow. That means my last question is “How do I make the time to do it all? This entry was posted in Uncategorized on July 26, 2018 by Tiffany Fitzgerald. The Ups and Downs of It All…. I am beginning my 3rd week “externing” at Siemens Energy Hub in Charlotte as part of the 2018-2019 Kenan Fellowship. Whatever I expected this experience at Siemens to be, I can’t even recall, but what it has been is eye-opening. While here, I have learned the science behind energy production, the corporate and local structure of Siemens, the overwhelming need to reinstate trade/vocational education, and the exhausting weight of steel-toed boots. Within the first 48 hours, I had multiple ideas floating around about what product would best reflect my time spent here, but it became clear pretty quickly that our students would most benefit from a blended learning unit that would help foster 21st century learning skills, such as collaboration, accountability, and flexibility. Thus, my project, How to Work Like an Engineer, was born! The biggest contributing factor to my success with this product is how utterly supportive and encouraging my team is at Siemens. My colleague-in-crime, Lisa, has been all in since Day 1. We work together seamlessly and naturally motivate each other. Likewise, every single person at Siemens has been happy to answer endless questions and offer up resources at every turn. I am confident I will finish my product by the end of this month. As with anything, the challenge is time. There isn’t enough time during the workday to do the actual work on my project, so I find myself working at home during the evening and weekend, just as I do during the school year. The key to making that a positive is that I have made my product relevant to multiple areas of my classroom and my professional development requirements. This entry was posted in Uncategorized on July 23, 2018 by Tiffany Fitzgerald. KFP Summer Institute. Come for the knowledge, stay for the dessert. There were so many unique and valuable things to take away from the week, but I am most excited about implementing digital portfolios. I already use portfolios in my classroom, but I hate dealing with the set-up and paperwork that goes into maintaining them. Because they are such a valuable tool in the classroom for reflection and conferencing, I wasn’t ready to abandon the idea. Enter Beth and Digital Portfolios! Boom! Problem solved! Using Google Sites, it is so simple to do this that I have already started planning it as part of the first week activities with my grade level team. I also procured the Strawberry Shortcake recipe and will be implementing it in my kitchen ASAP. This entry was posted in Uncategorized on June 27, 2018 by Tiffany Fitzgerald. Expectation is such a heavy word. I expected to arrive in Cullowhee and be instantly aware of how insignificant I am in the scope of teaching here in the great state of North Carolina. I expected to be inundated with strategies, programs, and pie-in-the-sky ideas that would be quickly shot down by financial restrictions, population limitations, etc. I expected to be reduced to being “the fun one”, once again, and never taken seriously during academic discussions. Instead, what I got in Cullowhee was a total realignment of my teaching philosophy…a whole new view of myself as an educator, and tools that I can implement immediately. I saw myself and my values reflected in others. I learned what the word Fellowship really means.